Put the honey, soy sauce, 4 tablespoons of the vegetable oil and the peppercorns in a large bowl and whisk together. Add the chicken, garlic, peppers, courgette, cherry tomatoes and aubergine, and toss well. Cover and marinate in the fridge for 2 hours. When ready to cook, preheat the oven to 190C/170C Fan/Gas 5. Line two baking trays with foil. 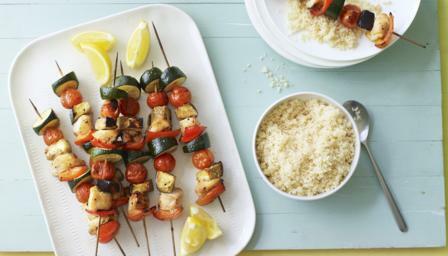 Thread the chicken and vegetables onto 10 skewers, alternating the ingredients as you go, then lay them on the prepared baking trays. Roast for 30 minutes, turning the kebabs halfway through, or until the chicken is cooked through. Make the couscous 10 minutes before you want to eat. Put the couscous in a shallow heatproof bowl, pour over the boiling water and mix in the remaining 1 tablespoon oil. Leave to stand until the water has been absorbed. Fluff up with a fork and season with salt, pepper and lemon juice.